Ophrys exaltata grows to a height of 30 to 50 cm – exaltata means tall. The inflorescence develops 4 to 15 flowers. Their broad sepals and petals are spreaded. The labellum is undivided or vaguely trilobed. The sepals and petals are mostly greenish-white. The dark-brown labellum has a pattern in the form of the letter H.
The species was first described by Michele Tenore in Ad Catalogum plantarum hortii regii Neapolitani (1819). 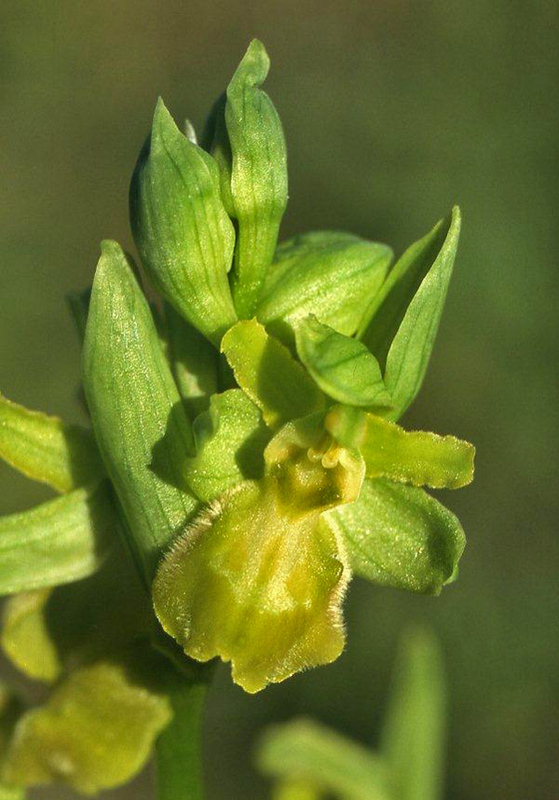 In the case of reduced or missing colour pigments, the labellum is green, the pattern is still visible as a white structure. Ophrys exaltata grows on dry meadows mainly in Southern Italy (Calabria and Sicily), but also in Southern France and North Eastern Spain, up to heights of 800 m. Flowering is from Februar to April.